NEW BMW CAR Series enjoys touches that make this bavarian car gain elegance. Under the hood, new engines are emerging, beginning with the three-cylinder of the Mini. Restyled BMW 1 Series (Geneva 2015). Image © BMW BMW 1 Series facelift (Geneva 2015). CES 2015: BMW pioneered the organic electroluminescence. At its launch, the BMW 1 Series second generation was somewhat disappointed with the style less balanced than released before. By this restyling, the Germany manufacturer puts things in place. While At the front, just only the shield and the optical change. So however, this is will enough to give more presence to the compact, thanks to wider kidney grille grille and headlight contour less convoluted. At the rear, the 1 Series abandons the square taillights, mocked for their resemblance to those of the Volkswagen Polo. Like the rest of the range, the BMW now adopts lights L, which has involved an overhaul of the tailgate. The shield is here as revised and available in several versions depending on the range of levels, such as in front. Indeed, BMW applies to the entire range finishes its differentiation policy. Inside, the new features are more tenuous. The dashboard remains unchanged effect. This is the side of the list of equipment we have to look to find something new. Now, all 1 Series receive automatic climate Office (single zone) and Tire Pressure Warning (mandated by the European Union). Optionally, there is the appearance of adaptive cruise control and automatic parking system battle. However, it is under the hood that innovations are the most important. Much of the range is renewed, using the latest generation of modular engines. In essence, the entry-level four-cylinder and gives way to the three-cylinder 1.5 already seen the Mini Cooper and BMW 216i Active Tourer. On the 116i (which replaces the 114i), the engine is deflated to 109 hp instead of 136 hp usual. The old 116i, with the four-cylinder 1.6 turbo designed in partnership with PSA with a power of 136 hp, simply changes its name to 118i. Above, there is a new 120i, equal with the BMW-PSA 1.6, in a variant of 177 hp. This replaces the old 118i with the same block, with only 170 hp. You still following? The 125i, with the four-cylinder 218 hp 2.0 BMW remains unchanged, while at the top, the M135i has the in-line six-cylinder earns 6 hp to develop a cavalry 326 hp. 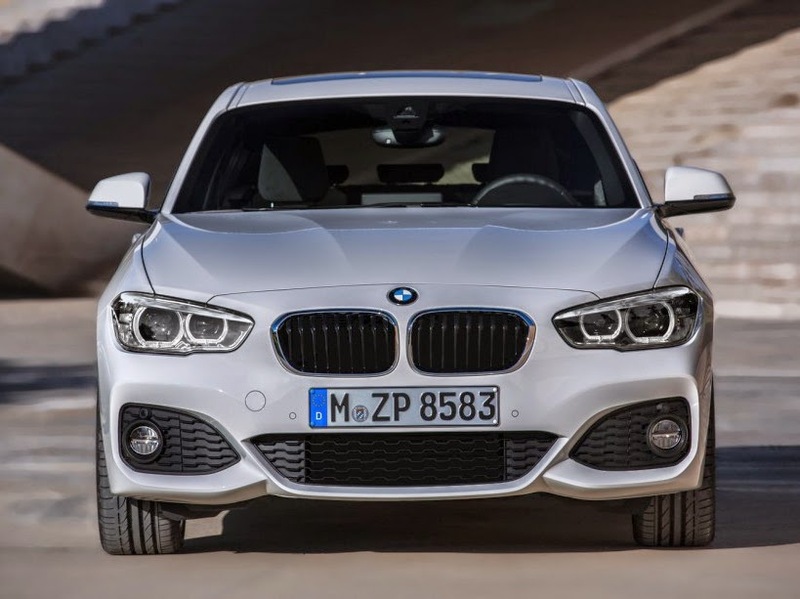 Restyled BMW 1 Series (Geneva 2015) BMW 1 Series facelift (Geneva 2015). Image © BMW. In Diesel, the range is completely renewed. The 116d, strong 116 hp, taken up in the same three-cylinder 1.5 Mini Cooper D 216d and BMW Active Tourer. Efficient Dynamics version, optimized for low consumption, announces an average consumption of 3.4 l / 100 km, which corresponds to CO2 emissions of 89 g / km. For higher power models, the 1 Series facelift takes up the new four-cylinder 2.0 resulting from the same family as the modular three-cylinder cited. It is available in three power levels: 150 bhp (BMW 118d), 190 hp (BMW 120d) and 224 hp (BMW 125d). Optionally, the majority of these models can receive automatic transmission ZF eight original.